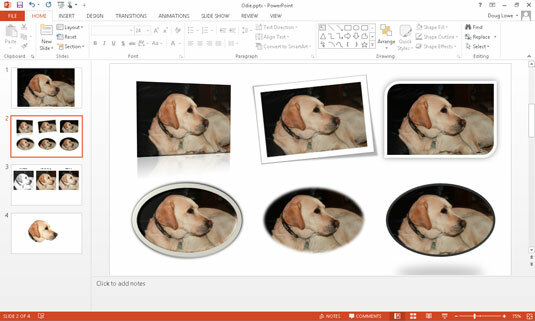 PowerPoint 2013 enables you to draw attention to your pictures by adding stylistic features such as borders, shadows, and reflections. Here is a slide with several copies of a picture, each with a different style applied. 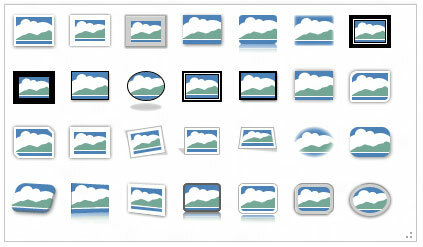 PowerPoint comes with 28 predefined picture styles, shown in the gallery. Each of these styles is simply a combination of three types of formatting you can apply to pictures: Shape, Border, and Effects. If you want, you can apply these formats individually. The best way to figure out how to use these effects is to experiment with them to see how they work.